Raptor007's Falcon 4 to Saitek Utility gives you full control over your X52 Pro joystick and FIP feedback capabilities while playing Falcon 4.0. Configure the MFD with many pages of game data. Assign LED colors and blinking to various game conditions for improved situational awareness. Render gauges, status text, and shared texture cockpit displays (from Lightning's MFD Extractor) to the Flight Information Panel (FIP). Bind soft-buttons to keystrokes to control the game from your devices. Compatible with Allied Force, BMS2, BMS3, BMS4, FreeFalcon, RedViper, and OpenFalcon. Source code is available on my GitHub page. You can also discuss this utility on on SaitekForum.com. All aspects of the output are user customizable; refer to the ReadMe for details. Install MFD Extractor. I recommend letting it launch automatically during Windows startup. Right-click each of the on-screen MFDs and click "Hide". Right-click the MFD Extractor tray icon and pick "Options..." to bring up the options window. Select the "Performance" tab at the top. Click the "Falcon BMS Advanced Options..." button. Check the "Enable exporting of 3D cockpit instrument images to shared memory" checkbox. The X52 Pro can scroll through multiple MFD pages again. Installing X52 Pro and FIP drivers together no longer requires manually replacing a DLL. DirectOutput seems to reliably detect all devices. Sending image data to the FIP is now much faster than it's ever been before. Before you install, you should use the Programs and Features control panel to uninstall any existing copies of Saitek DirectOutput. If you want to be really thorough, you could also use the Device Manager to uninstall all drivers with VID_06A3 in the hardware ID, but it shouldn't be necessary. Unfortunately there is no compatibility between the old Saitek DirectOutput 6.2 SDK and the newer 6.6/7.0 SDK, so if you're sticking with the old Saitek 6.2 drivers for your X52 Pro, you'll probably need my older Falcon 4 to X52 Pro Utility. 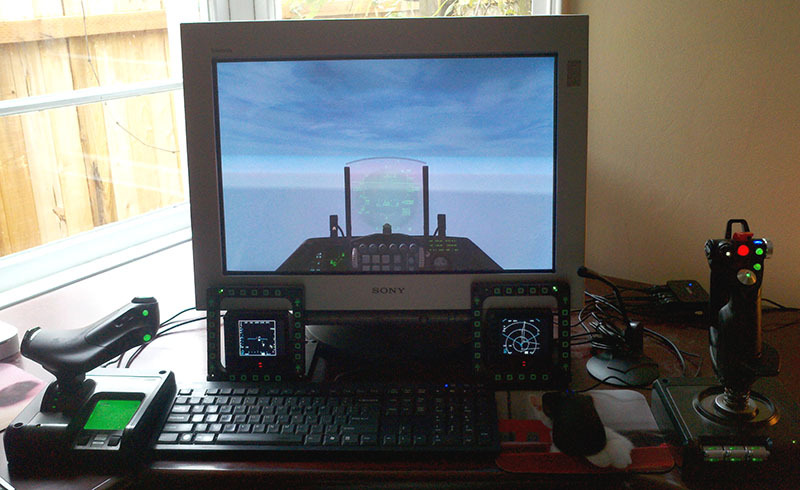 This old version has no FIP support at all; it is only for LED and MFD control of the X52 Pro with driver verson 6.2.